If you've followed the first two blogs in this series you'll know it may be possible to earn a 3,800% return on funds invested when operating amongst the elite of email marketers. However, to get up among the elite requires a whole bunch of email marketing parameters to be optimized. We've previously blogged about the first of those - a clean, accurate, opted-in email contact list that utilizes levels of automation to enable accurate segmentation and progression of leads through the sales funnel. Now, in this second blog of the series, I'm going to explain the concept of, and the need for, developing Buyer Personas and mapping contacts to the different stages of the Buyer's Journey. May have a future need but is not at the decision making stage for purchasing the product or service. Marketing emails that fail to incorporate these elements of sophistication will perform poorly in terms of open and click rates as well as lead to higher contact degradation rates through opt-out's. Furthermore, in performing poorly, the marketer will fail to establish him or herself amongst the elite and will fail to earn the highest levels of return on their marketing investment. 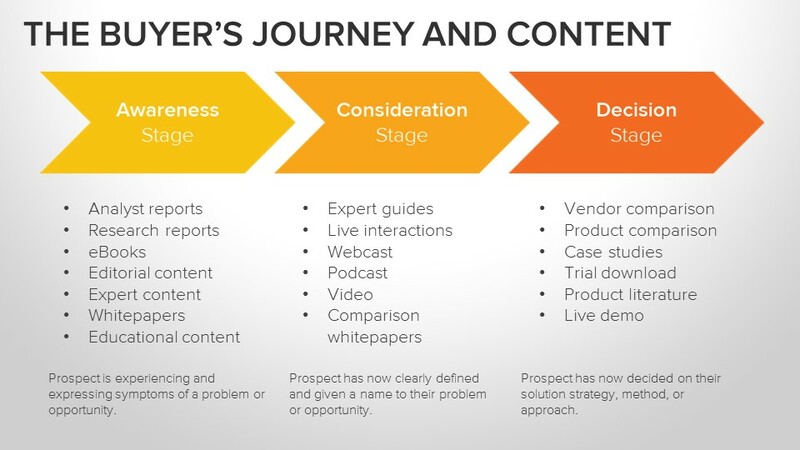 If you're new to inbound marketing and the concept of the Buyer's Journey, then you may not fully understand the concept of mapping your content to where a buyer is in the decision making process. Download our proven Content Mapping Template and start to maximize engagement with your email campaigns!